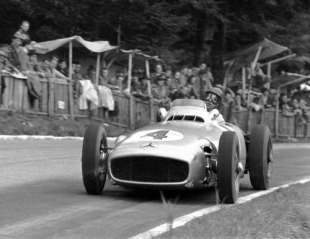 Juan Manuel Fangio secured his second world championship with victory at the Swiss Grand Prix. It was his fifth win of the season and his third in four starts for Mercedes since the team's return to F1 earlier in the summer. After tinkering for four races Mercedes had stripped away the extra bodywork and the W196 now resembled the other open wheels on the grid. Despite the change, they were outqualified by the impressive Jose Froilan Gonzales but once more asserted their dominance in the race proper. Despite several days of torrential rain, for the race the track was dry. Fangio was soon ahead with Mike Hawthorn's Ferrari and Stirling Moss' Cooper chasing hard; however, as had happened at the Nurburgring, both suffered mechanical problems, allowing Gonzales to move back to second and ensure the second successive Argentine 1-2. Hans Hermann took third on his debut, his Mercedes on eof only eight cars left running at the finish. This was to prove the last grand prix on Swiss soil. As a direct result of the Le Mans tragedy in 1955 that year's grand prix was cancelled, and the Swiss authorities subsequently banned all racing in the country. While there have been Swiss Grands Prix since, confusingly they have been held in other countries.